Her father being the sole earning member, is finding it very difficult to support the family. His farming work depends on the rain, which is unpredictable. The parents have the desire to educate their children and give them a safe and secure future. Anu was healthy at the time of admission. Anu comes from an economically poor family. Her father is a farmer and her mother is a homemaker. She has one older brother who is one year older than her. 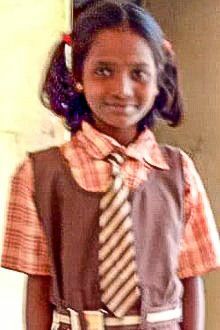 Tell your friends Anu needs a sponsor!